During their six months at the museum, the 20 animated, life-size dinosaur models clawed their way into the record books as the most visited temporary exhibition in Queensland Museum’s history with 231,485 visitors. 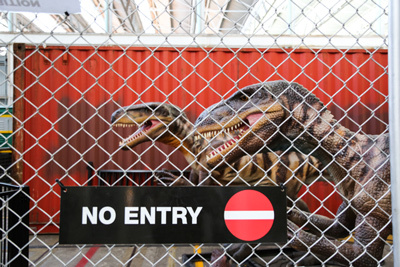 Having stamped their authority as Queensland Museum’s most successful temporary exhibition, the dinosaurs are exhibiting some diva behaviour and have set up camp at The Workshops Rail Museum for a makeover, to ensure they are in perfect working order for the exhibition opening. Queensland Museum CEO and Director Professor Suzanne Miller said everyone’s favourite dinosaurs would be returning as part of the exhibition, after a brief stint at The Workshops Rail Museum for a refresh. “Lurking amongst the locomotives at The Workshops Rail Museum are some extraordinary creatures who have been surprising many who have stumbled across them,” she said. “The distant roars of Australovenators can be heard as you meander through The Workshops and many have been surprised when they round a corner and spy these ancient beasts back of house stomping amongst the trains. Dinosaur Discovery: Lost Creatures of the Cretaceous will once again be supported by a range of informative, hands-on children’s activities, and an augmented reality dinosaur app. For the first time, the museum’s youngest visitors will be able to experience the magic of the exhibition after hours with two ‘Night at the Museum’ events scheduled, which include family-friendly entertainment and activities. And for when the kids are tucked up in bed, the popular After Dark series will allow visitors to step back in time to the Cretaceous era while enjoying a drink and pre-historic themed entertainment and music in this 18+ event. Dinosaur Discovery: Lost Creatures of the Cretaceous opens at the Queensland Museum on 21 June and will run until 9 October 2016. Tickets are now on sale through QTIX or by calling 13 62 46. Visit www.qm.qld.gov.au/dinosaur for more information.